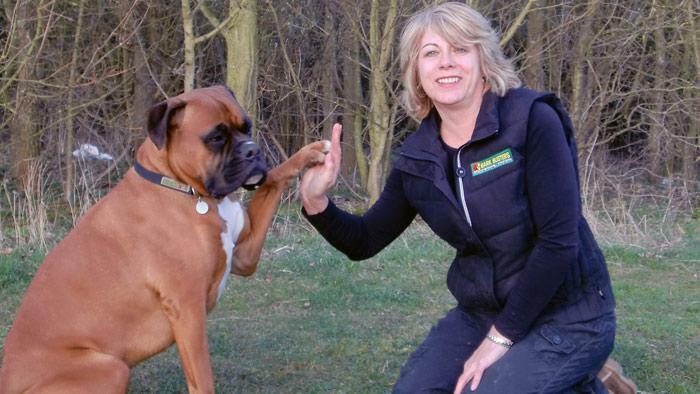 Hi my name's Lynn and I'm your local dog behaviour therapist for Bark Busters Home Dog Training in Bletchley. Some years ago I came to the same conclusion myself as my beautiful boxer puppy was quickly turning into a grown up nightmare. He thought no-one should be allowed into his house, he would not come back when I called him and he would lunge at other dogs on the lead to name just a few of his problems. Fortunately I was recommended to Bark Busters Home Dog Training by a friend and after the very first visit Ralf's behaviour began to significantly improve. The local therapist explained to me how I was giving Ralf all the wrong signals and explained the difference between human and canine communication. Armed with this knowledge, the techniques she had shown me, and her continued support, Ralf's behaviour transformed in a very short space of time. Some months later I discovered that there was an opening for a Bark Busters therapist in the Bletchley area, so I contacted them. Having seen how well I had worked with Ralf, I applied and was tutored through their extensive training programme. I have never looked back. I love my vocation and love facing the challenges of even what may seem to be the most difficult dogs. It's all about understanding and communicating, something I am confident I can teach to you. 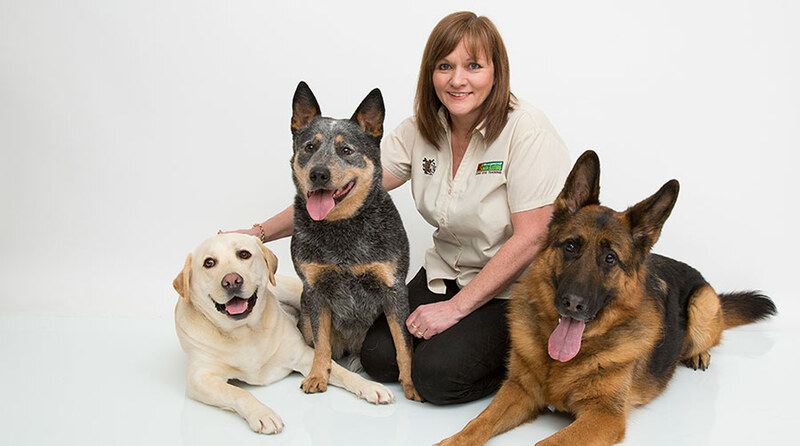 During my years with Bark Busters I have helped owners and dogs with all types of behaviour problems barking, jumping up, recall, obedience, toilet training, separation anxiety, dog aggression, and stranger aggression. Both I and Bark Busters are committed to helping owners and preventing the worst for their dog. Just last month I helped two owners avoid having their beloved dogs put to sleep for aggression. But whether it is something as serious as this or just making sure that your pet stays safe by always returning to you when called or even puppy management for new owners wanting to get it right from the start, I am here to help. I will spend time in your home, with you and your dog, assessing why you are facing your current problems. Then we will form a sensible achievable training plan for you to follow and with the Bark Busters Guarantee you can be confident that I will be there to support and guide whenever you need me, and that I will return free of charge to help with any reoccurring or new issues. With our help you can change your dog's behaviour as I did. Ralf is now a happy contented dog who volunteers as a Pets as Therapy dog and I am also a Pets as Therapy Dog Temperament Assessor. Lynn has been fantastic within one day there is already a dramatic improvement in all aspects. she has left me feeling positive and that there is light at the end of the tunnel. 98% of my clients rate their experience with Bark Busters as 4 or 5 out of 5 stars. 98% of my clients would recommend Bark Busters to their friends and neighbours. 98% of my clients think that their dog responded to the training. Average rating 4.8 out of 5 based on the last 245 reviews out of 361. Extremely helpful in understanding our dogs and the reasons for their behaviour. Also the ways in which to modify their behaviour and, again, the reasons why very well explained and demonstrated. Lynn accepts payment by cash or the debit and credit cards below.